The Vegi Mexican Cookbook. Mexican recipes. Vegetarian cooking is made easy, nutritious and elegant with this fine cookbook. Begin with a Chiles Con Queso served with your own homemade flour tortilla chips. You can also dip them on the best Guacamole recipe. Then bring out the Chiles Rellenos With Ancho Chilies and Cherry Tomato Salsa and Braised Greens With Black Olives and Capers, both colorful and nutritious. Finally, treat yourself to Sweet Nut Tamales with Strawberry Mango Sauce or an assortment of Fruit Ices. 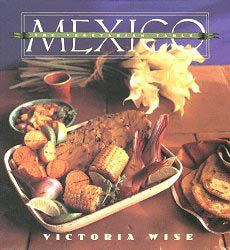 There are over thirty full-color pictures here, an extended glossary of ingredients, and simple, easy-to-read recipes that bring Mexican cuisine to your vegetarian table.